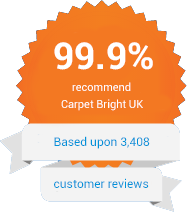 This website is owned and operated by Carpet Bright UK. All contents including text, design, graphic and the information provided on this site are the copyright of Carpet Bright UK andall rights are therefore reserved. Carpet Bright UK and the trademark Carpet Bright UK® may not be used in connection with any service, product or offer that is not the property of Carpet Bright UK in a way which is likely to create misunderstanding amongst customers or the general public, or in any manner which demeans or discredits Carpet Bright UK or may be regarded as likely to do so. Permission is granted to copy, print and distribute in hard copy sections of this site to allow information-gathering or for the placing an order with Carpet Bright UK. Unauthorised use of information, images or any other content contained on this site without express prior permission of Carpet Bright UK may violate copyright, trademark and other applicable UK laws. Neither the Carpet Bright UK company name nor any other element of its branding (including logo, design, images or trademark) may be replicated, copied or used by any other in any manner whatsoever. Other registered trademarks and trademarks used on this site remain the property of their legal owners and used on this site solely for descriptive purposes. Mention on this website of trademarks held by other parties is not to be construed as a challenge to these trademarks' validity or legal ownership. Carpet Bright UK respects all relevant trademarks which are marked accordingly. “The Company” – means Carpet Bright UK. “Technician” means the individual (or sub-contractor) carrying out cleaning services on behalf of the Company. “Client” means the person, company or corporate body together with any subsidiary or associated company as defined by the Company Act 1985 to whom services are supplied by the Company. “Services” means the cleaning work carried out by the Company’s operatives. “Appointment” means the visit made by CBUK staff member/s to the Client’s home or business address by the technician in order to carry out the Service. 1.2 Unless the context necessitates otherwise, reference to a singular person include the plural and references to the masculine include the feminine and vice versa. 2.1 These Terms and Conditions constitute a contractual legal agreement between the Company and the Client. 2.2 The Client agrees that any use of the Company’s services, including placing an order for services by telephone, email, via the company website or by other electronic means constitutes acceptance by the Client of these Terms and Conditions. 2.3 Unless it has been confirmed in writing by a director of the Company, the Terms and Conditions given here are to prevail over any other terms of business or conditions of purchase proposed by the Client. 2.4 No variation or alteration of these Terms and Conditions shall be accepted as valid unless it is has been confirmed in writing by the owner of the Company. 3.1 The Company reserves the right to amend the initial quotation provided by its representative, should the client’s originally stated requirements change. 3.2 The Client understands that additional Parking and Congestion charges may apply to the job fee if the technician attending the appointment incurs such charges. 3.3 All cleaning orders are subject to a £100.00 plus VAT minimum call out charge. Our minimum call out charge can vary. 3.4 If the Company operatives need to collect keys from a third party's address outside the postal code of the premises where work is to be carried out then a £10.00 plus VAT charge may be added to the price of the service. 4.1 Payment is due on booking of the service in the form of credit/debit card payment or bank transfer. Carpet Bright UK reserves the right to cancel services without notice due to failed transactions or non-cleared funds. 4.2 Payment is politely requested on booking of the agreed service. 4.3 Payment cannot be made by cheque or cash on completion. 4.4 For commercial clients payment is requested within 10 days of invoice. If payment is not made within this period, the account will be passed to Carpet Bright UK’s debt collections agency, after which a charge of 15% on top of the initial invoice due will be added to the debt. The Client agrees as part of this contract to pay this charge which represents our reasonable costs in collecting the unpaid Amounts. 4.5 Customers should understand that any late payments may be subject to additional charges if the Company incurs such charges in the event of being required to take legal action to collect late payment for its services. These charges include Debt Collection Agency Fees, Legal Costs, Court Fees and other reasonable costs. 5.1 Refunds will be issued only if the client has cancelled a cleaning visit more than the permitted period (48 hours) prior to the commencement of the work and where payment has been already taken by the Company. 5.2 Refund will be issued if for any reason a technician fails to attend a cleaning visit for which payment for which has been already collected by the Company. 5.3 Refunds will be issued only after the Company has been permitted to rectify any problems or perceived deficiency in the service it has provided. 6.1 If a customer discount requires a voucher, the Company will require the presentation of the relevant voucher before giving the discount. Failure to present in advance will mean no discount. 6.2 The Company reserve the right to cancel any discounts or promotions without giving notice. 6.3 A discount voucher cannot be used in conjunction with any other offers or promotions. 6.4 No discount codes or vouchers are valid in December. 7.1 The Company shall not be liable under any circumstances for any loss, damage, delay, additional costs or compensation charge (whether direct, indirect or consequential) suffered or incurred by the Client arising from or any way connected with a late arrival of a technician at the Client’s address. The Company endeavours to arrive promptly and within a clearly stated and agreed timeframe for all booked work, but transportation problems, road conditions, breakdown of our equipment or vehicle issues are beyond our operatives’ control and sometimes results in delays. These unforeseen delays can sometimes necessitate re-scheduling. 7.2 The Company reserves the right to be deemed not responsible for incomplete cleaning services due to the following occurrences: lack of hot water or power, a third party entering or present at the customer's premises during the cleaning process; wear or discolouring of fabric becoming more visible once dirt has been removed; failure to remove old/permanent stains or odours that cannot be removed using standard carpet cleaning methods; existing damage or spillage that cannot be cleaned/removed completely and any accidental damages caused by our technicians if the customer has an unpaid balance owed to the Company. 7.3 The Company shall not be liable under any circumstances for loss, damages, delay, costs or compensation (whether direct, indirect or consequential) which may be incurred by the Client arising from or any way connected with the Company carrying out services for the Client if the Client has an outstanding amount aged 14 days or more from the date the payment was due. 7.4 The Company can not be held liable for cellulosic browning which is caused by age deteriorating carpets, rugs, fabrics and upholstery. 7.5 The Company may record all incoming and outgoing phone conversations for quality control, record keeping and in case of referrals which made arise from subsequent inquiries or investigations. 7.6 Any household items or furniture moved by our technicians is at the clients risk and the company does not accept any liability for any loss or damages. 8.1 The Company holds full Public and Employers Liability Insurance policy. This policy covers claims caused by the owner and those directly employed by the Company. 8.2 The Company uses the services of partner companies and sub-contractors. In cases of a customer’s claim where it is the partner company or the sub-contractor that delivers the service, the subcontractor will appoint their own insurance company to settle the claim. 8.3 The Company has no liability in the event of a customer claim against a partner company or a sub-contractor if: the settlement is not what the customer wants or if the claim is void or cancelled. 8.4 The Company reserves the right to refuse to share any of the confidential insurance company’s details and documents which include any details and documents relating to a partner company or sub-contractor. 9.1 All Client complaints about the Company’s services must be received in writing by email. 9.2 In the event of the Client being dissatisfied with the service provided, the Company asks that the Client gives notification as soon as the problem becomes apparent by calling 020 3011 5590. We request that Clients do not wait until the job is complete before raising concerns. 9.3 The Client accepts and understands that poor or deficient standards of service or alleged damage or theft must be reported within 24 hours of their occurrence. Failure to do so within this timeframe will dis-entitle the Client to refunds as the Company will not consider any complaints which are notified once 24 hours has passed since completion of the work. 10.1 The Company will impose a £50.00 cancellation/lockout fee for the cancellation or rescheduling of a booked visit where less than 48 working hours’ notice (working days Monday to Saturday) is given for non-contract Clients. The same fee will apply if the technician is unable to gain access to the Client’s home or place of business, through no fault of the Company. 10.2 The contracted Client agrees to pay £50.00 if 1) the Client cancels the service or amends its required date/time less than 48 hours prior to the scheduled appointment; 2) the Client fails to provide access to the site of work thus preventing the Company from executing it. 10.3 The Company will do its best to accommodate changes in dates and times of booked work, but requires a minimum of 48 hours’ notice of the requested change. Please note that it is not possible for the Company to guarantee that an individual technician will be available on the new day and at the time the Client requires. All appointments are amended subject to the Company’s existing work schedule. 10.4 The Client agrees that should a cleaning service be cancelled, he/she will not subsequently hire or use any technician introduced to him/her by the Company. If the Client does wish to hire or use the company’s staff in a private capacity then he/she must pay the Company a referral fee of £1000.00 (one thousand British pounds). When booking Carpet Bright UK’s services by telephone, e-mail, via the Company website or other electronic means, the customer agrees to be bound by the Company’s terms and conditions stated above. The Company reserves the right to make amends to any part of these terms and conditions without prior notice. These Terms are governed by the laws of England and Wales, and are subject to the exclusive jurisdiction of the Courts of England, and Wales.